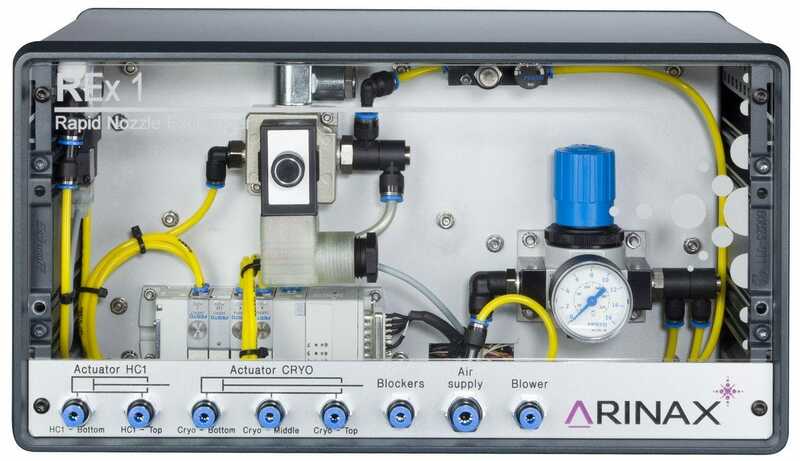 REX Rapid Nozzle Exchanger - Controlled Crystal Dehydration - Arinax Sc. 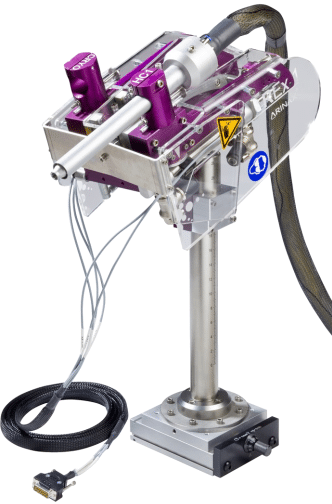 The REX is a remote controlled nozzle exchanger designed to be combined with the HC-Lab for crystal dehydration experiments on MX crystallography beamlines. Once the crystal’s optimum RH value is determined, the crystal can be flash-cooled for final data collection. Switching from the humidity nozzle to the cryo nozzle is done very quickly and with a cryo nozzle trajectory which avoids “flat” temperature gradients at the sample position. The permanent nozzle mounting guarantees a stable nozzle alignment for both nozzles before and after the nozzle movements. 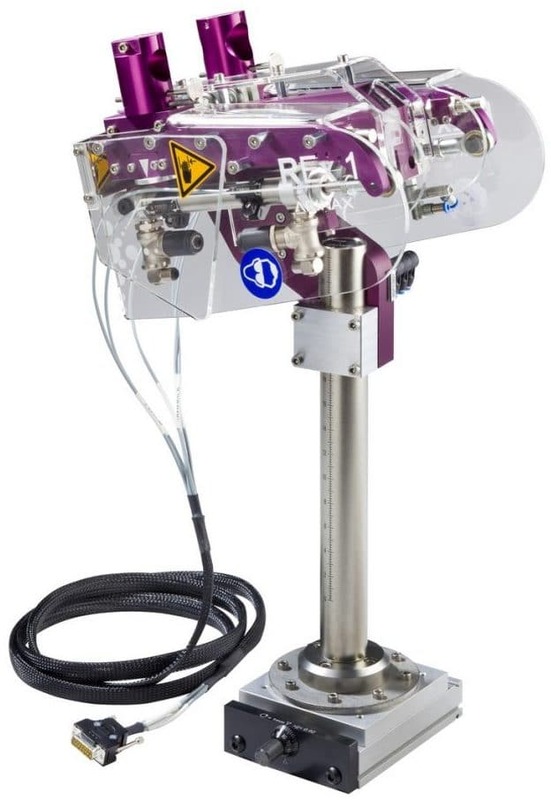 The REX rapid nozzle exchanger allows a 10 mm retraction of the cryo nozzle for manual or automatic sample recovery/mounting. The REX control electronics supplies the necessary I/O channels for synchronization with a sample changer robot. Moving “out” both nozzles at the same time (retraction by about 180 mm) frees the space around the sample position. This allows maintenance on the goniometer close to the sample position without losing the nozzle alignment. 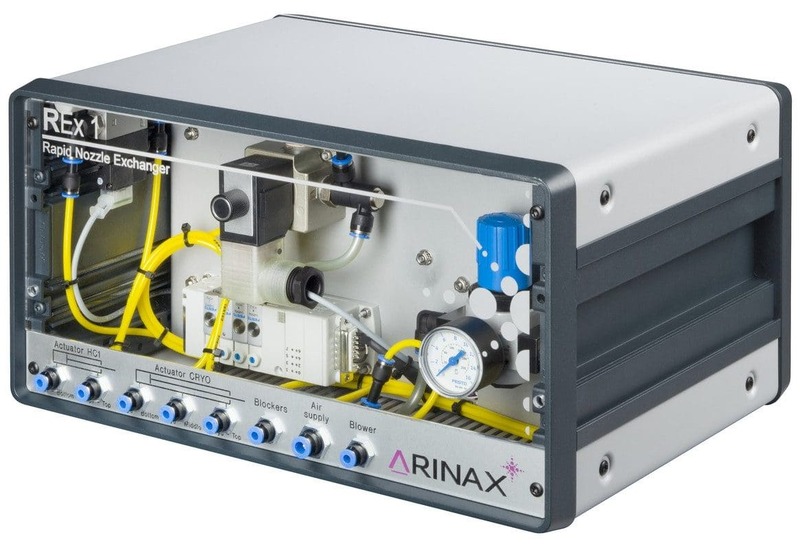 The Arinax team is highly specialized and we are used to customizing our equipment in order to adapt to various environments, either in a home lab or on a synchrotron beamline. Please feel free to contact us if you have any technical questions.